It's been a while I've been craving for a quiche, a zucchini quiche! So today I woke up with only one thing on my mind, making a quiche. Well, I've been emptying the fridge this week, I had to cook with all the leftovers because tomorrow we're going on a vacation for 2 weeks. I just finished packing, and I am so excited to see my family and spend some quality time with them. 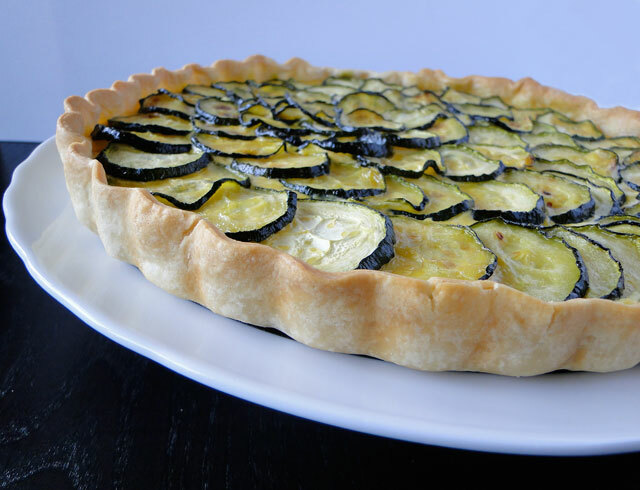 This quiche is very easy to make, super delicious of course if you like zucchinis. Quiches is a versatile dish, take a few eggs, a bit of cream, some bacon and a unbaked pie crust and within 30 minutes you've got one delicious and versatile entrée! Preheat oven to 400°F (200ºF). Fit pie dough into pie plate and lightly prick all over. Bake according to package instructions, then transfer crust in pie plate to a rack. While crust bakes, cook the ham in a skillet over moderately high heat, and saute 5 mn stirring occasionally. Place the zucchini slices on a baking tray, season them with salt and pepper, and drizzle a little bit of olive oil, then grill them in the oven on 400ºF (200ºC) until tender and starting to brown. Reduce oven temperature to 350ºF (180ºC). Heat cream, milk, pepper, and 1/4 teaspoon salt in a saucepan until mixture reaches a bare simmer, then remove from heat. Whisk together eggs in a large bowl, then gradually whisk in hot cream mixture until combined. Stir in ham and cheese and pour into piecrust. Arrange the zucchini slices on top and bake until filling is just set, 25 to 30 minutes. Préchauffez le four à 200ºC. Déroulez la pâte dans un plat à tarte, et piquez le fond avec une fourchette. Faites cuire à blanc 10 mn environ. Réservez. Pendant ce temps, faites revenir le jambon émincé dans une poêle environ 5 mn. Placez les rondelles de courgettes sur une plaque à four, salez, poivrez, arrosez-les d'un filet d'huile d'olive et enfournez à 200ºC jusqu'à ce qu'elles soient tendres et à peine dorées. Réduisez la tempérture du four jusqu'à 180ºC. Dans une casserole, faites chauffer à feu doux la crème, le lait, le poivre et 1/4 càc de sel. Ne laissez pas bouillir. Dans un saladier, battez les œufs en omelette, puis ajoutez graduellement la crème chaude et mélangez. Ajoutez le jambon et puis le fromage. Mélangez bien. Versez cette préparation sur la pâte. Disposez dessus les courgettes et faites cuire de 25 à 30 mn. That's a beautiful zucchini quiche. Excellent photography! awesome looking quiche! gruyère cheese, mmmmm. 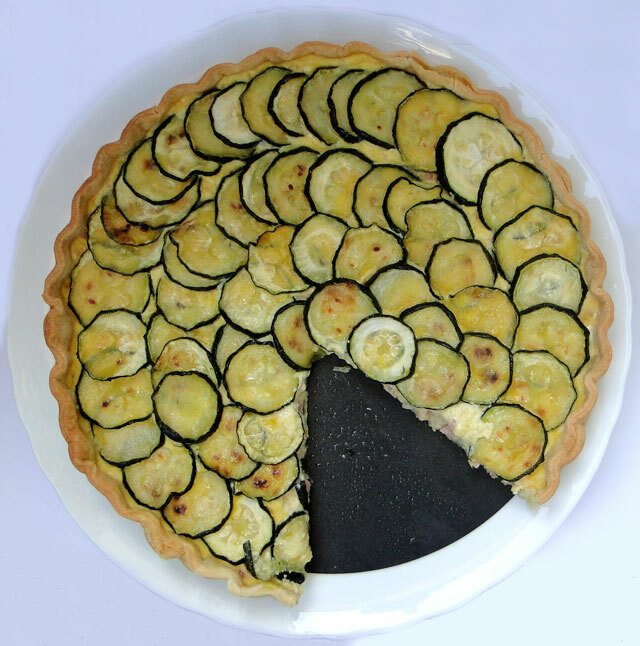 Looks like the perfect quiche and I love the symmetry of your zucchini ~ awesome! Beautiful! I love that perfect layering. I bet that quiche tastes haevenly! What a lovely blog you have here. Love the look of this quiche! So beautiful. I am sure it tastes fantastic, too. Have fun on yoru trip! This quiche is absolutely gorgeous. The top is tantalizing. beautiful looking tart,Love the layers on top. A different recipe than mine, i don't add ham , and I sprinkle the cheese and little bread crumbs on top before baking. Enjoy your trip and have fun with the family. 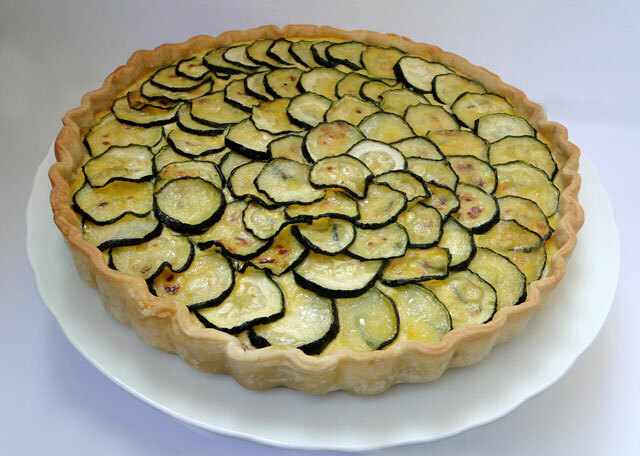 That's a great looking quiche, although I despise zucchini. Your quiche looks so festive! I love the idea, and might try it with eggplants too. Thanks for sharing. Have fun on your vacation! All I have to say is yummy, yummy, yummy, delicious. Love the missing wedge of quiche! 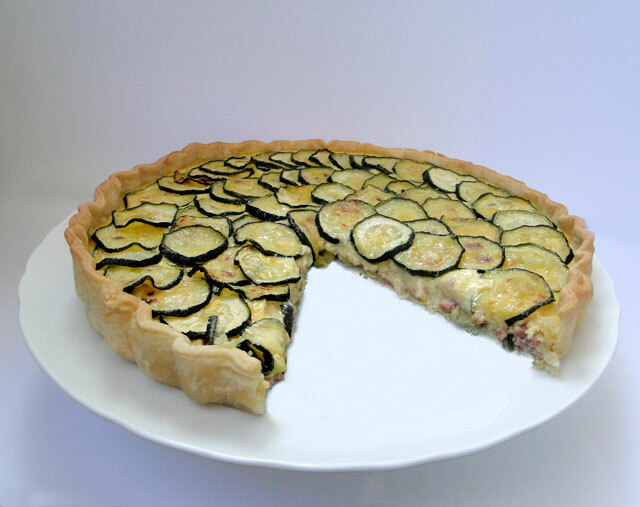 Tout ce que j'aime dans cette quiche! That quiche looks amazing and sounds really tasty! Zucchini rings couldn't look better! Zucchini is a vegetable that I want to use in new dishes. And this sounds and looks awesome. A must try recipe. So gorgeous! The combination of zucchini and ham & cheese sounds terrific! Great quiche Chicho! You are right sometime one craves a good quiche and at least in the US, one has to make it at home to get a good one! Great flavor combo. Your quiche is beautiful!! What a beautiful fresh looking quiche. I love how you arranged the top too. That's a nice looking quiche indeed. Great flavours in there. Have a wonderful vacation! The zucchini on top makes it extra special.